Amelia Lakes in Fernandina Beach, Florida. Nestled around a 26-acre spring fed lake just minutes from the splendor of Amelia Island lies the modern, yet cozy sanctuary of Amelia Lakes. This gated condominium resort offers top-flight amenities, a world-class location and a unitque maintenance-free lifestyle in a peaceful, lakefront setting. Amelia Lakes offers a lkae front, resort-style swimming pool, perfect for a quick dip or a long afternoon lounging beneath the palm trees. For those who like to work with scenery, the pool area features wireless internet access. The fully equipped fitness center with separate cardio room and plasma TVs' helps you stay in shape, while the conference room is available for any ventures that require your attention and also provides wireless internet access, printers and computers. The recreation center provides billiards while the children entertain themselves in the play area. Challenge a friend to "game-set-match" on the lighted tennis court or hit your best spike on the popular sand volleyball court. Of course, you can always choose to just relax the day away by the lake. 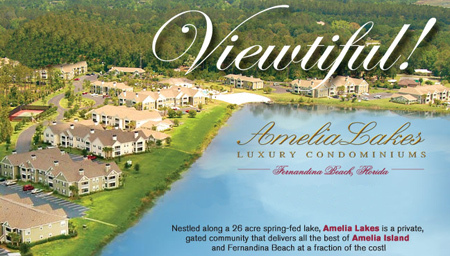 Each home at Amelia Lakes is designed to make life more beautiful. Floor plans for the one-, two- and three-bedroom residences are from the 806 sq.ft. to 1,435 sq.ft. Pricing from the upper $100's-$200's.